Though fewer people in the U.S. and Latin America identify as Catholic, Latinos are the biggest source of growth for Catholic churches in the U.S. The Catholic Church is in steep decline in the U.S. — but one bright spot is the country's Latinos. Hispanics represent one-third of the U.S.'s roughly 70 million Catholics, a share that has risen steadily in recent decades as the number of white Catholics has dropped. Even more significantly as the church looks toward its future, more than half of the millennials who identify as Catholic are Latino, as are two-thirds of millennial Catholic churchgoers, The Jesuit Review estimates. But the church has work to do if it wants to keep these Latinos engaged. The share of Catholic believers is dropping in the U.S. and in Latin America, and young people are the most likely to leave, according to Pew Research. To draw in millennial Latinos, some Catholic leaders are speaking out in support of immigrants and LGBTQ rights, and churches across the country are boosting their social media presence and hosting young adult masses. The goal is to stop the church from losing millennials like Nicholas Carrillo, 24, a second-generation Mexican-American who grew up in East Los Angeles, home to one of the largest Catholic populations in the U.S.
Carillo left the church as a teenager because he felt the religion catered more toward his grandparents' generation. He now works full time as a campus organizer for the Secular Student Alliance in Los Angeles. “I left because I felt like people were being made to believe only out of fear of hell and fear of being punished," Carrillo said. "It seems evil to punish someone for all of eternity for a sin or two." Carillo is part of a growing group of lapsed Catholics in the U.S. While 70 percent of adult Latinos identified as Catholic in 2006, that figure fell to 57 percent by 2015, according to The Center for Applied Research in the Apostolate (CARA), a nonprofit research center. In the face of this decline, the church is counting on Latinos like Sara Sánchez. A second-generation Guatemalan American, the 18-year-old Penn State University student is an active member of her local Catholic church. Carrillo is the kind of young Catholic who is active in her parish, participating in service and volunteer projects and helping out with Sunday school programs. A diocesan survey of Hispanic ministry released April 30 found that about 50 percent of U.S. Catholics ages 14 to 29 are Latino, and 55 percent under 14 are Hispanic. The Catholic church has been increasingly looking toward Latinos, in particular millennials, as the number of white Americans who identify as Catholic has rapidly declined. “Two decades ago, white Catholics outnumbered non-white Catholics by nearly ten to one. Today, they are nearing parity” in the U.S., said Robert P. Jones, founder of the nonprofit Public Religion Research Institute and author of The End of White Christian America. These numbers coincide with the steep growth in the U.S. Hispanic population in the last two decades, primarily due to immigration. In 1980, Latinos were 6.5 percent of the total U.S. population; today, they're over 17 percent. Pew estimates that of the immigrants coming from Latin America, about 63 percent of them are from Mexico, a Catholic stronghold. This is significant, because while many countries in Latin America are seeing steep declines in the number of people who identify as Catholic, Mexico is still overwhelmingly Catholic. A Chilean polling firm, Latinobarómetro, reported in a January 2018 survey that the number of Latin Americans who identified as Catholic has fallen from 80 percent in 1995 to 59 percent now. But there is great variation among countries — while only 37 percent of Hondurans and 39 percent of Salvadorans identify as Catholic, that figure rises to 80 percent among Mexicans. The challenge of an aging priesthood and the struggle to define the church's message and mission for modern congregations are among the reasons the Catholic church has been struggling to fill its pews for decades, according to Arlene Sanchez-Walsh, a professor of religious studies at Azusa Pacific University. While growing up in Morelia, Mexico, Fabiola Cortés, 53, attended Catholic Mass every Sunday with her family. But for her, the religion felt too formal and rigid. “Priests would tell me that only they had the wisdom to interpret the Bible correctly,” she said. Cortés, who moved to the U.S. 30 years ago, still wears bracelets of her favorite saints around her wrists. But the Richmond, Virginia resident no longer identifies as Catholic; she joined the Baptist Church in the early 1990s. 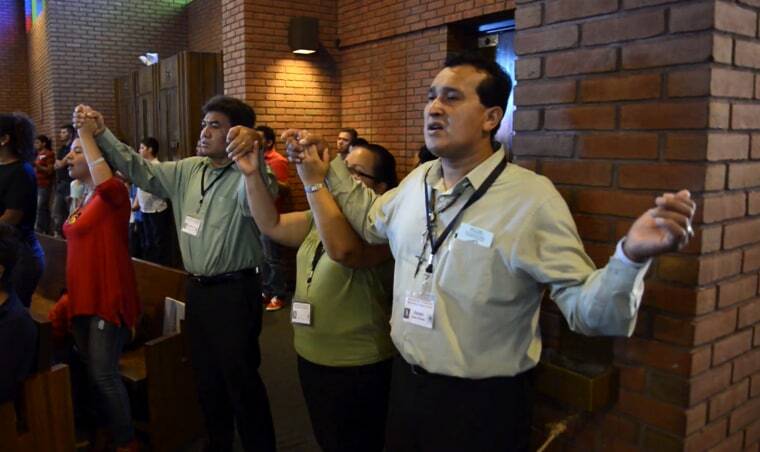 Evangelical movements have grown in Latin America, too, since the 1970s. "The Catholic Church really started to feel the pressure of competition from other religious movements like Pentecostalism,” said Sanchez-Walsh. Even Pope Francis has been unable to reverse the five-decade decline despite his high approval rating among Latin Americans. The Chilean poll shows that from Francis' election in 2013 to 2017, Latin America saw a 4-percentage-point drop in people identifying as Catholic. U.S. Latinos like political scientist Juhem Navarro-Rivera, 39, say the decision to leave the church has become easier in recent years. Navarro grew up Catholic in Puerto Rico and only deconverted when he moved to the mainland U.S.
“During the 1990s in Puerto Rico there was a lot of taboo around deconverting and in those days it was harder tell your friends that you were a non-believer,” Rivera said. Some Catholic leaders like Archbishop José Gómez of Los Angeles have seen their churches grow when they embrace issues that are relevant to the community. A native of Mexico, Gómez is the first Hispanic to be elected to the position and actively speaks out on issues including LGBTQ acceptance and immigration. "As a nation, we have a moral and humanitarian obligation to the Dreamers," Gómez said in a January 2018 blog post calling for a legislative solution to DACA. "These young people have done nothing wrong. And their futures hang in the balance of these debates." María Fernández, 38, an active member of Los Angeles' Cathedral of Our Lady of the Angels since immigrating to the U.S. in 2000 from Honduras, described Gómez "as a breath of fresh air." "I'm so used to priests never talking about pressing social issues that impact everyday people like me," she said. Aware of the gap in youth outreach, many parishes are focusing on social media and creating more experiential outreach programs. The Archdiocese of New York is using Instagram, Twitter and Meetup.com to connect to younger people, with outreach programs like Revolution for Change!, which emphasizes community service, and V Encuentro, a yearly meetup of Latino Catholic organizations. St. Patrick's Cathedral in New York City hosts young adult masses every first Wednesday of the month. “We are reaching out to young adults across platforms and have experienced consistent growth,” said Colin Nykaza, director of young adult outreach at the Archdiocese of New York. According to Nykaza, the Archdiocese of New York has seen a 30 percent increase in practicing Latinos over the last few years. In Wichita and Kansas City, Kansas, parishes have spearheaded a Theology on Tap lecture series, where young adults meet in local bars to talk about religion with their reverends. “More than a social media presence, the Church must be a space where people find hope, forge community, and where they come for guidance as they make sense of the world around them,” said Felipe Hinojosa, an associate professor of history at Texas A&M University, who studies and teaches about American religion. Sánchez, the Penn State student, believes that through outreach, the church will be able to bring more Latinos into the fold.